This piece appeared in The Big Issue in September 2014. It is strange to see a man’s dream made real in bricks and mortar. There are, in fact, quite a few strange things about Poundbury. Walking around this small Dorset settlement on a sunny day, the place feels both urban and rural; traditional and radical; utterly serene and ever-so-slightly eerie. A place full of contradictions. As one of the town’s architects Ben Pentreath puts it, Poundbury “tries so hard to be inoffensive that it is fascinating to watch how offended its critics can get”. Poundbury is the living embodiment of all Prince Charles’ ideas about architecture and planning. Just over 25 years ago, fed up with the “monstrous carbuncles” littering Britain’s built environment, the prince asked the architect Léon Krier to masterplan a new settlement on land owned by the Duchy of Cornwall (an estate established back in 1337 to provide an income for the heir to the throne). Twenty years on from the first houses, the anti-modernist vision has taken a discernible shape. 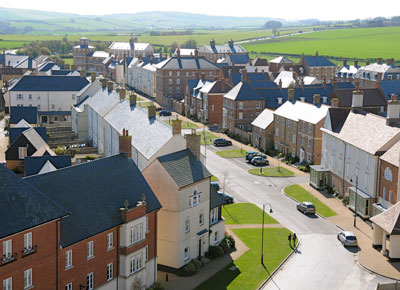 Poundbury is a simulacrum of a historical Dorset market town, planned and built over a couple of decades to look like the result of centuries of “natural” growth. Unlike most suburban housing developments, homes, shops, businesses and even a couple of factories are all mixed together on the same estate. This integration – Prince Charles believes – breaks dependency on cars and fosters the stronger sense of community that comes from street life. One architectural critic describes the local fire station as “the Parthenon meets Brookside”But it is the style of architecture – snootily dismissed as “chocolate box” neo-Georgian – that has attracted all the attention. One architectural critic describes the local fire station as “the Parthenon meets Brookside”. Another deems the place “a toy town, a museum of a mythical past”. There are a few intellectual admirers, however. Novelist Will Wiles thinks Poundbury is “a fabulous curiosity… a psychedelic urban experience”. What about the people who experience it – psychedelic-free, presumably – on a daily basis? Lunchtime sees the people of Poundbury flit busily between the little Waitrose, the garden centre and the Engine Room Café around Queen Mother Square – the grand civic space still undergoing expansion. Copper says the “us-and-them” mentality between Poundbury and Dorchester, the main town from which Poundbury emerged, has now faded. “For me, it’s been a lovely place to live and work,” she says. “I think at the beginning we – in Poundbury – were quite separated. People talked about living on ‘the Poundbury’, like it was an exclusive thing. It should be pointed out: Poundbury does have a much wider variety of housing types than its metropolitan critics give it credit for. There are tacky excesses, to be sure (a few too many bolt-on, mock-classical porticos). But among the 1,200 completed homes there are fine five-storey Georgian terraces, cottages crafted from locally sourced, chunky grey stone, and ambitious arts and crafts-type dwellings that channel Charles Voysey and Charles Rennie Mackintosh. It’s a pleasure to wander the winding streets, turn a corner and come across the distinct work of another architect. And lest anyone imagines the place as an entirely middle-class enclave, the Duchy of Cornwall is keen to stress another key component of Poundbury’s quiet success: the integration of social housing. The latest phase of development has a 35 per cent element of affordable housing (upped from the 20 per cent proportion offered in the first phase). Guinness Hermitage owns and manages 218 of these properties, where social rent levels range from £98 a week for a one-bedroom flat to £138 a week for a four-bedroom home. But things are changing, ever so subtly. In line with the rest of the country, new Guinness homes at Poundbury will have their rent set using the Affordable Rent Criteria: levels capped at 80 per cent of the local market rent. Whether houses are dubbed “social” or “affordable”, builders across the country usually drag their heels with anything that can’t be sold or let on the open market. They prefer to build the minimum required amount of social stuff away from prioritised development so it doesn’t affect house prices. And the recent controversy over ‘poor doors’ in London – separate entrances at mixed-tenure estates – shows how much Britain struggles with housing segregation. But Poundbury has managed all this without much fuss. There are no streets or avenues that scream ‘social housing sector’, no homes that announce any kind of second-class status. And when I meet the Duchy of Cornwall’s estate director Simon Conibear to walk around, even he appears to have difficulty pointing out the Guinness-run dwellings from those sold on the private market. House prices remain buoyant, and Conibear believes it’s not simply the high standard of building but the “favourability of the environment”. Depending on access to garages and private gardens, two-bedroom apartments and semi-detached homes in Poundbury can start anywhere between £190,000 and £275,000. Many of the three-bedroom detached homes go for somewhere between £325,000 and £400,000. Local estate agent Maria Kemp says prices are “marginally” more expensive than in nearby Dorchester. “There has been criticism that the prices in Poundbury are too expensive for some people in the area,” she says. “The sad reality is the majority of these people had little to no chance of buying a house in the area pre-Poundbury. So what might Poundbury have to teach the rest of the country? Pentreath – who designed some of those handsome Georgian terraces near Queen Mother Square – believes there are vital lessons to be learned. But merely copying the style of the buildings would be misguided. “There is no right and wrong when it comes to architectural style,” he explains. “You could build a Poundbury using only contemporary styles. It’s the underlying planning that is radical and should be heeded. Yet the conditions that led to Poundbury’s creation would seem to be very unusual. Walking around the place, it’s difficult to avoid photographs of its founding father Prince Charles, shepherd’s crook in hand, lending a faint whiff of 19th-century paternalism about the whole affair. Not every town or county has a benevolent benefactor. The big land-grabbing housebuilders are not up to the planning of civic squares or making sure shops and businesses are on board from the beginning. So is it really possible to imagine a master-planned, red-brick, neo-Victorian Poundbury taking shape on the outskirts of Manchester or Liverpool? Conibear, the Duchy’s estate director, concurs. “We’re very conscious of legacy, that things we’ve done should be a credit to current and future dukes,” he explains. “But we’re not actually in a different position from local authorities or government organisations that have land to develop on. So there you have it. Poundbury might not offer new ways of increasing housing supply but it does offer up ways of doing development better. As I make the 15-minute walk back into Dorchester town centre, there is a gentle reminder of small insufficiencies. I pass a puffed-out middle-aged man carrying his Lidl shopping bags from Dorchester back into Poundbury. A discount supermarket is not something Poundbury has planned for but it’s something some of its residents clearly still need. It goes to show: nowhere exists in self-contained perfection.